August 4, 2018, 9:39 AM · Well, I’m into my second year of lessons. I’d say I’m very committed to learning violin. As a retired adult learner, I have the time to play and it is a rare day when I don’t get in at least an hour of practice. Indeed, I average around 75 – 90 minutes a day. I’ve done two recitals, two intimate soirees with other students, and I even went full-tilt-boogie in May and played just about everything I know in a pub. I knock out practices in 30 minutes sessions, doing scales – major and minor – for 30 to 40 minutes a day, new material for 30 minutes, and golden oldies for the final 30 minutes. I’m better than I was six months ago, and I anticipate I’ll be even better six months from now. . I wake up each morning eager to practice. I think if I’d given this much focus to my years of guitar and mandolin playing I’d be some sort of studio musician by now. By the way, those two instruments – my guitar and mandolin – are not happy campers these days. I haven’t really played either in months. It’s like I’ve moved on in relationships, but don’t have the heart to say anything. But they know. Both of them sit on their music stands and watch me practice the violin. Oh, I’ll patronize them on occasion. I’ll pick up the guitar, tune it, and strum a few chords. I might even do a flatpicking song or two, but that’s it. The same goes for the mandolin. I’ll tune it, play it, realize it’s so much easier than a violin, then put it back down and walk away. Alas, it’s hard to tell old lovers things have changed. Should I sell them? I don’t think so. What if something happens and I can’t play the violin anymore? 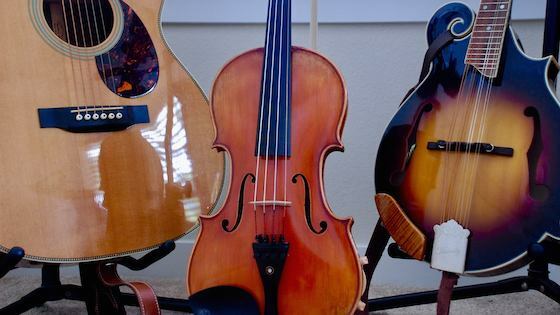 What if my fascination with the violin is more of an infatuation than a long-term relationship? (It isn’t.) Is that just plain tacky that I’d just keep them in reserve like on deck substitute reserve players in a sport? What if I actually buckle down and practice on all three instruments everyday? (No. That ain’t gonna happen. I just know it.) I mean, it’s a great mandolin and a beautiful retro Martin guitar. I know I could sell both on eBay, get at least $4,000 for the two of them, trade in my current violin, and get an amazing violin! I have no reason to upgrade at this point. I’m better than I was, but not ready for prime time. The newness is over, and now I’m just digging in and focusing on the moment. My pitch is improving, although it tends to go sharp if I don’t focus, my left thumb is still pressing too tightly against the instrument, and I have to be careful my right wrist doesn’t curve upward. I have a way to go, but I’m doing it. Also, I can’t think too much about next year or the year after. Not to get morose here, and this is a topic our western culture doesn’t really like to talk about in any practical contexts, but at my age there are two question marks hanging at the end of each sentence, year, and decade. How much more time do I have? And, does that matter? To me, the answers to those questions are rather simple. Focus on the moment and let the next moments simply happen. Enjoy what you have at the age you are because – face it - the options aren’t good. On the one hand, I do a lot of that older person stuff – I walk into rooms and forget why I walked in there in the first place. I’ve spent five minutes looking for my glasses, only to realize I’ve been wearing them all along. I have to make sure I turn off the gas on the stove, and close the refrigerator door. I have to check my thoughts so I don’t become fussy and petty. On the other hand, I exercise every day. I do yoga, Pilates, walking, hiking in the woods, weight lifting, and bicycling instead of driving a car. I have 10 pounds to lose, but I’m working on it. (Sort of.) I read three newspapers a day, novels, books on science, the New Yorker, I watch dumb videos on YouTube, binge crime shows on Netflix, HBO and Amazon Prime, see friends at least once a week, and enjoy a glass or two of wine. I don’t take myself too seriously. I do all of this knowing there is a clock ticking. When you get to my age – and I know a lot of you are already here – things happen. A friend calls up and says there is a lump. Someone else says they found something somewhere in their body. I watch a friend smoke cigarette after cigarette and wonder if I’ll see that person in 10 years. Someone is on chemotherapy. Stuff happens. It could get depressing, and a lot of people surrender, but it doesn’t have to be that way. The violin, above anything else, keeps me centered. It’s like meditation. When I do scales, it’s not boring. I play a drone with each key and get lost in the sound. There is something about these weekly lessons, about this daily practice, and also about moving that bow on those strings that grabs me hard. Will I ever play in an orchestra? Who knows? I’m not going to automatically erase that possibility. I do know I will get out to Irish and Bluegrass jams sometime within the next few months. For my 70th birthday next year I’m treating myself to a week a Fiddle Tunes Workshop in Port Townsend, Washington., and if that goes well I may do it every year. For the most part, however, I’m just going to take it as it comes along. So, I’m into my second year, I’m making progress, and right now I’ve got to stop writing this and go practice. Keep it focused, keep it light, work hard, and avoid negative people. The Well Aging Fiddler or learning to play a violin at 68 years old. First Entry. Discussion: Is it ever too late to learn the violin? Thank you for a bit of inspiration. I'm in the 41st year and still enjoying the violin - the only instrument that I can play. (I did teach myself how to play the right hand of a keyboard because I was DJ for my church and needed to do a few intro's...) As long as it is still fun. Although, I have to say that I'm encountering physical limitations as the years go by. August 4, 2018 at 10:14 PM · Good to hear from you again and how your journey is progressing. Many of us are on the same path and it’s nice to share thoughts and experiences! August 4, 2018 at 10:14 PM · Quite a touching and gracious post. Thank you. Hope you have many more years of playing. August 5, 2018 at 02:41 AM · Thanks, Michael. Like you, I am nearing 70 this year and picked up the violin about two years ago. I love it. August 5, 2018 at 03:58 AM · Michael, you seem like a kindred spirit. I am 66 years old (still working) and try to fit in violin lessons when I can. I love playing scales, you are right, it is like meditation. And I have a beautiful Taylor guitar and Ome open back banjo that aren't getting enough attention but I will never get rid of them. I started with folk guitar and bluegrass banjo back 45 years ago, and started to take violin lessons then. Dropped it for 30 years and picked it up again 10 years ago when I found a beginners string orchestra. August 5, 2018 at 12:35 PM · Michael- It is inspirational to see someone keeping at this into older age.You seem to have a good plan to move ahead. I sometimes wish I had more practice time. I'm older at 56 and still work. I mostly play Irish music. Like you my other instruments have taken a back seat to me new love. Really I think it's more like I NEED focus to that degree on violin because this instrument needs more attention. I was one of those guys who had to tell friends they found cancer in my prostate. I had stage 3 considered to be fairly aggressive.PSA 9.5. I had robotic surgery and focused radiation in Dec. The good news is the last three tests can't detect anything. For all practical purposes I'm clean thank God.After something like that though and in seeing those close to you get sick and pass on you begin to realize how short time can be. We can only make plans for today and even they might not happen, so I liked your "living in the present" observations. August 6, 2018 at 02:18 PM · Michael, your story is very inspiring and confirms that playing a musical instrument is more about desire and being self motivated. I picked up the violin when I was in my early 40's and have since had the awesome experience to have played in numerous ensembles and community orchestras. I encourage you to check out what community ensembles are in your area. Another idea is to inquire with local churches to see if there are playing opportunities for various seasonal programs they may put on. Good luck and thanks for sharing about your journey as a violinist! August 6, 2018 at 08:46 PM · Thanks to all of you for your comments and stories. Let's keep it going. It's good to know that although we usually practice alone there are many of us enjoying the same experience. Dave - If my violin and I get down to Eugene, we'll get together for some songs. Take care. August 7, 2018 at 01:25 AM · We've heard the Arthur Ashe quote thousands of times during our lives, "Succuss is the journey, not the destination". Enjoy playing the violin everyone, the journey never ends and therein lies the beauty AND the challenge! August 7, 2018 at 06:39 PM · Wow thanks for the inspiration! I’m 61 and took up the violin about a year ago. I still work full time so don’t devote as much ch time as you and not sure if there is any underlying talent. I was taking lessons but didn’t seem to be going any where. Key is finding someone to work with. I do love the instrument but would like to start sounding better. Any advice? I’m in San Antonio. August 7, 2018 at 07:09 PM · Perhaps a consideration for we older dudes...I'm 78, have been playing for 70 years....retired from teaching in '99, still play in two community groups but have relinquished my chair with a Wedding Quartet...those durn loft stairs are tough on old knees sans cartilage....and while dabbling at solo literature is fun, I find more satisfaction from playing thru and working on orchestral literature...not the excerpt books but actual 1st violin parts easily copied from the net....I can day dream about playing the concert master solos in a couple famous Rimsky-K's great tunes, and trying to gain pristine clarity in things like 4th movt of Mozart 39...and great fun with so much great music....I still occasionally sit-in for wedding/funeral gigs and relatives' needs....and Stay In Shape. August 7, 2018 at 09:06 PM · Well, the only way I've found to start sounding better is to practice, and then practice some more. At this point I have my moments, but they are only moments. Just hang in there, be patient, and find a good teacher. August 7, 2018 at 10:30 PM · Yes, finding a good Teacher was essential for me! It makes all the difference. I started when I was 47 and now I am 57. An amazing journey! The hard practice is needed, but once you are at a level you are happy with, you can just let go and the Violin will never leave you................just some simple tunes every day whenever you feel like. It was really essential to me to choose the pieces which I really like from my heart. Those pieces will still improve over the years and will never get boring. They became part of me and I can talk through them. Michael, your story is amazing! It's great to grow old! August 9, 2018 at 11:26 AM · Thank you for sharing. I'm 62 and plucking away at lessons that I truly enjoy, hopefully, getting better each year. I DO play in an orchestra. Just wish I was retired so I had more time to practice and do all those things I enjoy. I stay physically active, mostly by swimming. It's been wonderful to still play the violin. Like many my age, I worry that my vision will someday give out or that my driving skills will dwindle preventing me from driving to orchestra rehearsal. Just taking it a day at a time for now. I can’t remember where I saw that quote but it sums up why I didn’t hold back: I started violin at 61. Still going five years later and I don’t intend to stop.